I received the following email a short while ago from a dependable source. I have no further verification except that the LA City firefighters did in fact go to Haiti. If anyone has any supporting details, please provide them. I just returned from Haiti with xxxxxxx. We flew in at 3 AM Sunday to the scene of such incredible destruction on one side, and enormous ineptitude and criminal neglect on the other. USAID, when in control of all inbound flights, had food and water flights stacked up all the way to Miami, yet allowed Geraldo Rivera, Anderson Cooper and a host of other left wing news puppies to land. Pulled all the security off the rescue teams so that Bill Clinton and his wife could have the grand tour, whilst we sat unable to get to people trapped in the rubble. Stacked enough food and water for the relief over at the side of the airfield then put a guard on it while we dehydrated and wouldn’t release a drop of it to the resuers. No shower facilities to decontaminate after digging or moving corpses all day, except for the FEMA teams who brought their own shower and decon equipment, as well as air conditioned tents. No latrine facilities, less digging a hole. If you set up a shitter, everyone was trying to use it. If any of you are thinking of giving money to the Haitian relief, or to the UN, don’t waste your money. It will only go to further the goals of the French and the Liberal left. If we are a fair and even society, why is it that only white couples are adopting Haitian orphans? Where the hell is that vocal minority that is always screaming about the injustice of American society? Bad place, bad situation, but a perfect look at the new world order in action. New Orleans magnified a thousand times. Haiti doesn’t need democracy. What Haiti needs is Papa Doc. That’s not just my opinion, that is what virtually every Haitian we talked with said. The French run the UN and treat us the same as when we were a colony. At least Papa Doc ran the country. From laist, January 12, 2010. From the Examiner, January 18, 2010. “In Los Angeles, where earthquakes are inately on the minds of area residents, actions speak louder than words. 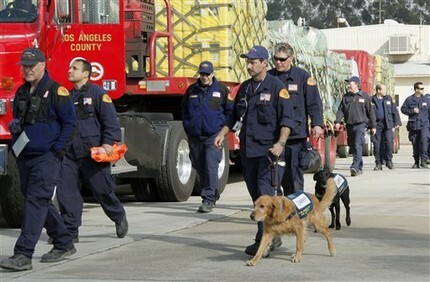 So, when the Haiti catastrophe struck, the Los Angeles County Fire Department’s Task Force 2 Search and Rescue team immediately readied for their trip to the devastated Caribbean naiton. Obama, Columbia University, Selective Service, Breaking The War Mentality, 1980, 1983, Did Obama attend Columbia?, Did Obama register with Selective Service? During the past two years I have read countless articles about Obama, his past and his associations. In conjunction and in many cases in harmony with many others questioning Obama, I have pondered and maintained in the recesses of my memory numerous troubling controversies. Recently, Pastor James Manning alleged that Obama did not attend Columbia University (college) and that the Saudis paid for his Harvard education. I find that allegation plausible. There are many aspects of an alleged record of Obama’s compliance that are disturbing, not the least of which is the signature. The article allegedly written by Barack Obama while at Columbia and published in March 10, 1983 is interesting without being linked to other aspects of Obama’s past. So little from Barack Obama’s past is available. The glimpse into his activities and associations that we do get is cause for great concern. Do not be surprised to see more of this presented here. The same day that Obama spun his web of deceit in a speech in Ohio, it was announced that unemployment in NC reached a record high of 11.2 percent. Today we have a breakdown of the 100 counties in NC. Listen to these speech exerpts and decide if Obama’s rhetoric matches reality. Record unemployment in NC report from the News Record. “North Carolina’s unemployment rate hit a historic high of 11.2 percent in December as the tally of jobs lost by the state’s workers since the recession started two years ago neared 250,000. December’s jobless rate of 11.2 percent rose from 10.8 percent in November, the Employment Security Commission said Friday. “Since the U.S. fell into recession in Dec. 2007, North Carolina has lost 248,000 nonfarm jobs. Manufacturers have slashed 95,500 workers since that time, while construction companies cut 65,800. Those two sectors shed 2,100 positions in December, but the month’s biggest loser was the 2,600 jobs cut by leisure and hospitality services like hotels and entertainment companies. From News 14 today, January 29, 2010. David Limbaugh wrote an excellent article about Obama’s narcissism on January 25, 2010. “The more painful exposure we have to Barack Obama — and we’re talking hyper-exposure at this point — the more we realize how narcissistic he is. Indeed, we are treated to this overexposure precisely because of his narcissistic impulses. He can’t keep himself out of the spotlight. Just in from Charles Kerchner of another case, Kerchner v Obama & Congress. Maybe the Supreme Court will look upon Obama’s eligibilty with more clarity now.